What’s Wrong with Modern Art? 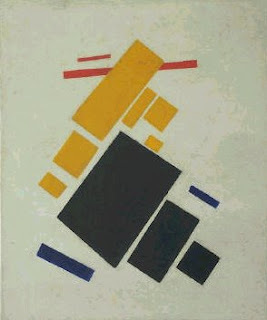 In a 202 class tonight, the instructor was lecturing on Malevich and Suprematism. Several people starting speaking up and saying, “That’s not art – I could do that!” and all of the other ridiculous comments that come along when 20th century art is discussed. The thing that made me most frustrated was that these students didn’t appear to listen as Angela tried to explain the meaning and purpose behind works like “Airplane Flying.” Their comments were rude and attitudes were obstinate. When Angela (the teacher) changed the slide to another Malevich work (are you familiar with “White on White?”), about 20 people in the class had the gall to laugh out loud (meaning that they thought it was comical that such a work could be considered art). I don’t know why I always say that Caravaggio is my favorite artist – I guess I always assume that people are asking about painters instead of sculptors, which is silly. The truth is, the only time I cried in front of a work of art was when I saw Bernini’s “David.” Caravaggio has never moved me to tears. I can’t even explain why I was so moved when I saw this sculpture. 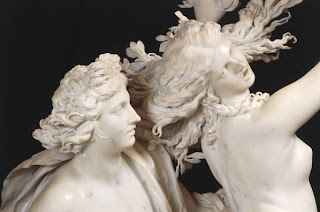 Perhaps it was because Bernini captures such tension, drama and movement in seemingly immovable marble. Perhaps it was because of the beauty of the human form – “David” is actually a self-portrait of the artist. And then again, perhaps there is no need to try and explain why I cried. After all, why does one cry in front of a work of art? I think tears can fill a void that’s created by the limitations of words. In fact, couldn’t that be one purpose of the visual arts – to express something and move people in a way that words can’t define? 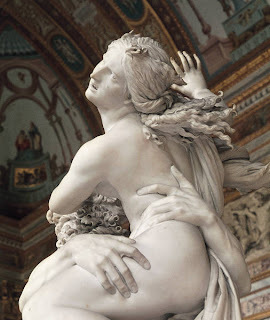 Below is a detail of “Pluto and Proserpina”, one of my favorite sculptures by Bernini. A master of creating different textures in his sculptures, Bernini contrasted the thick, rough hands of Pluto with the soft skin of Proserpina. Furthermore, the illusion of real flesh is incredible – I love the way that Pluto’s hands indent into Proserpina’s thigh and torso. It’s hard to believe that this is actually marble instead of real skin (one of my professors calls this a “marble to marshmallow effect”). 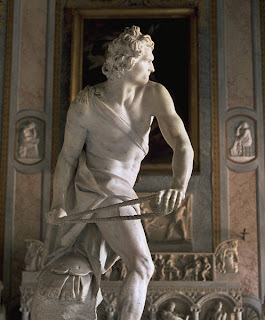 There are so many other great things I could say about Bernini’s work, but perhaps I will save them for another post. 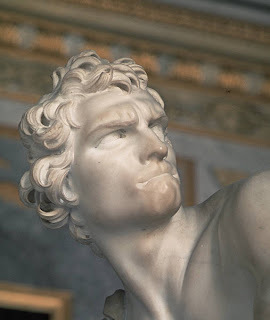 One of the greatest sculptors of all time deserves more than one post, don’t you think?